Swiss-type CNC Lathes, Automatic Lathes, Turning Centers, Vertical Machining Centers, Horizontal Machining Centers, Multitasking, and LaserSwiss Machines. Allow our dedicated team of sales engineers, application engineers and customer support experts partner with you to tackle your toughest manufacturing challenges. The M08J allows you to do many machining operations from turning, drilling, boring, and thread cutting. The manual tailstock with programmable quill provides additional support for long or slender machining operations. Ideal for a wide range of applications, the M08J is built for high accuracy, high productivity machining. 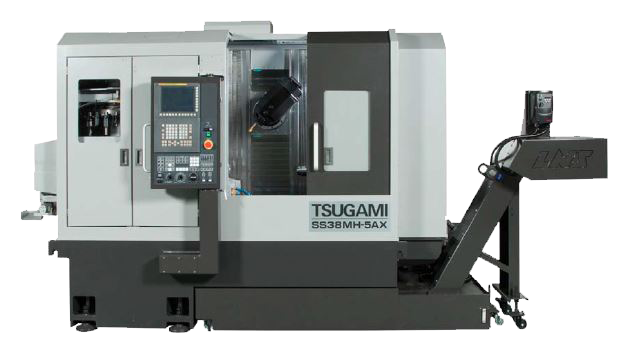 The Tsugami SS38MH-5AX sliding headstock lathe with B-axis is a chucker-convertible, high-performance automatic CNC lathe offers full 5-axis simultaneous machining with a FANUC 31i-B5 control. This machine’s backworking overlap with live tool capability allows for multiple tools in the cut and is equip with a total of 52 tools, including a 40 tool magazine, 10 tools on the back tool post, and an optional 2 tools on the deep hole drill holder. 5 modular type live tools on back tool post for optimum allocation of machining capability. The Precision Tsugami B0125-III LaserSwiss is a 12 mm, 5-axis Swiss style CNC lathe with a fully integrated SPI laser cutting system is the only one of its kind. This machine is chucker convertible and includes 10 tool positions, including laser head. Tsugami combines the precision of traditional Swiss Turning using gang tooling with the flexibility of an indexing turret tooling in these productive turning centers, which are ideal for machining complex shaped workpieces in a single set-up. Front and back tool posts offer flexible tool options, turret capability delivers Y-axis capability. Tsugami presents a range of Swiss Type CNC Lathes with the additional functionality of live tools mounted on a B-Axis. This unique configuration enables you to produce contoured and sculpted parts in a single setup while still maintaining the accuracy only obtainable with Swiss turning. Modular tool zones and live cross and face tools combine to give you unsurpassed capability. Certain models are also convertible with an optional chucker kit. This range of Swiss Type lathes from Tsugami feature a three-path CNC control which enables simultaneous use of the main spindle, gang tool plates and sub spindle delivering extremely short and highly productive cycle times. Full complement of driven tool positions for both main and sub spindle. Tsugami's vertical machining centers are built for high accuracy and high speed, all featured in a space saving platform. Tsugami introduces the world’s first CNC Lathe that combines CNC laser cutting with traditional Swiss Turning. Tsugami/Rem Sales features CNC turning centers, equip with Y-axis with and without built in gantry. 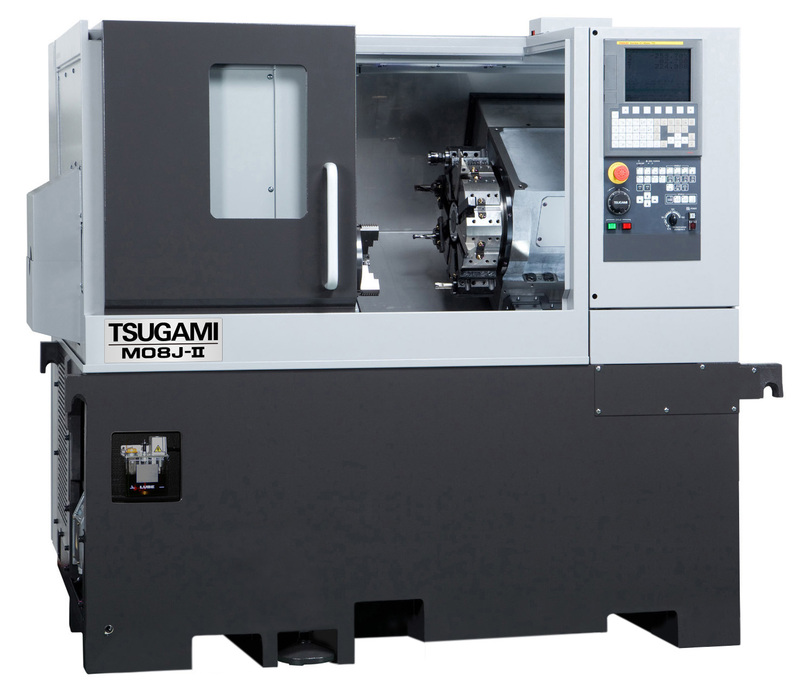 The Tsugami M08 is a powerful lathe on a rigid platform. Tsugami/Rem Sales' powerful fixed headstock lathes feature a compact footprint on an extremely rigid platform.